Providing comprehensive coverage of all important reactions of organopalladium reagents, Palladium Reagents and Catalysts demonstrates applications to organic synthesis, recommending possible future research. Industrial and research chemists working on synthetic methodologies and organometallic reactions as well as organic, natural product, pharmaceutical, organometallic and fine chemical synthesis, will find Palladium Reagents and Catalysts an essential reference source and indispensable research companion. 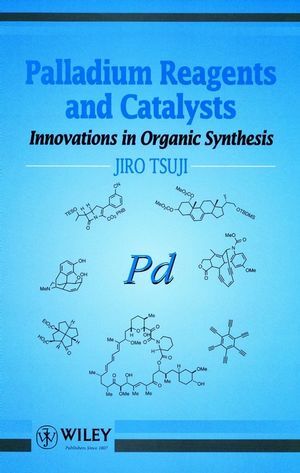 Jiro Tsuji, Okayama University of Science, Okayama, Japan, is the author of Palladium Reagents and Catalysts: Innovations in Organic Synthesis, published by Wiley. The Basic Chemistry of Organopalladium Compounds. Classification of the Reactions Involving Pd(II) Compounds and Pd(0) Complexes in This Book. Oxidative Reactions with Pd(II) Compounds. Catalytic Reactions with Pd(0) and Pd(II). Various Reactions Catalyzed by Pd(II) and Pd(0).